Something is missing from the G’day Canucks website. Something so essential that I’m surprised the comments section hasn’t gone into meltdown and crashed the WordPress servers. I’m talking about Vegemite – that glorious black sludge of a spread that Aussies love. Without a Vegemite post, G’day Canucks would be like Shaggy without Scoobie, Mick Jagger without his luba lips, a Canuck without hockey, a bike without two wheels (unless you ride a unicycle! ), Posh without Becks, Angelina without an orphan, an Aussie without a boomerang (we all carry them you know!!). Anyway, you get the picture! Back to Vegemite lesson 101. Vegemite is a spread used on bread, toast or savory biscuits. Some hard-core Vegemite lovers will also tell you that it is great mixed with hot water as a drink. Most people spread a thin layer of Vegemite on toast or bread (I think toast is best!). You don’t spread it as thickly as you would peanut butter or jam; you should still be able to see the bread. Way back in 1922 a chappy by the name of Cyril Callister was trying to work out what to do with brewery waste from the Carlton United Breweries. He mixed the leftover yeast extract with celery, onions and salt and voila, Vegemite was born. That’s right, good old Cyril made Vegemite out of beer waste! I’m not sure if that makes it more or less appealing. It’s made from brewers yeast extract, plus various vegetables, wheat and spice additives and salt. It has such a unique flavour that it is difficult to describe. It is very salty and is almost like a beef soup stock. Terry Pratchett said it best, when he wrote about it in The Last Continent. He described it as being burnt beer soup with a ton of salt in it, and that it tasted dreadful, but was bonzer stuff on bread, Mate. Do all Aussies really like it? 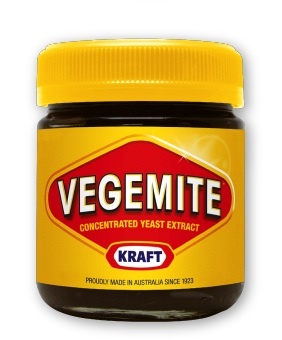 According to Kraft, 70% of Aussie households will have a jar of Vegemite in the cupboard. I personally thought the figure would be even higher than that. Maybe the other 30% just haven’t been to the shops lately! Over 22 million jars are produced each year, which equates to about 1.2 billion serves of Vegemite. We eat it for breakfast on toast. Send the kids to school with a Vegemite sandwich and spread it on crackers for a snack. Many of us take it with us when we travel the world. It is high in B-group vitamins, it has virtually no fat, but is high in salt. The only negative thing, health wise, is the high salt content. Come visit Australia! If that’s a bit too far, just Google ‘buy Vegemite online’. It is also available in various supermarkets and specialty stores worldwide, so just keep your eyes open. In Ottawa, the only place I’ve found it is at the ‘Scottish and Irish Store’. Is there a Vegemite song? From one happy little Vegemite to another – have a good day. This entry was posted in Recipes and food, Uncategorized and tagged aussie, australia, australian, canuck, food, happy little vegemites, how does vegemite taste, humor, humour, taste, travel, vegemite, what does vegemite taste like, what is vegemite, yeast. Bookmark the permalink. Ha – very cool! I have always wondered what exactly it was and what it tasted like! In Nova Scotia you can get it at the Atlantic Superstore as well as Tim Tams at some of them. It is a good thing too because my three Ratbags love it. The other day I tried Milo and the Canadian version is so very very wrong. It is more of a powder like Nesquick – apparently in Canada it has to dissolve completely! Thanks for dropping by Scott. We were excited as well when we found milo, but it didn’t pass the Aussie test. The other thing we miss is cordial, especially Cottees coola flavour. I got to spend three months back in Perth over Christmas with work and I was drinking so much Coola cordial, but I struggled to finish a full glass as my 1 year old loved it! Best invention ever! Love it!! Where would we be without it Ange? Wow! What an awesome blog. And I’m not saying that just because you visited mine or wrote about Vegemite, as worthwhile as they both are. I’m also going to link my blog “Vegemite” references to this blog as your explanation of our country’s national dish is so thoroughly & eloquently explained. Wow right back at you! Thanks Kim – greatly appreciated! Thanks for the information. I like trying new foods, but I’m not too sure if I’ll try Vegemite. It is an acquired taste, but one well worth trying! Great one Nic!! Very well done. I agree, I would have thought more than 70% of Aussies would have had it in their cupboard. How anyone can open a jar of vegemite and peer into it and then end up spreading it over toast is something I have never overcome. After our arrival in 1956 my mum bought the first jar of it after advice from a neighbour who just could not live without it. I can tell you, I have lived a successful life without ever been tempted to eat that brown stuff. Give me a raw herring anytime with some chopped up red onion..
Isn’t it a rite of passage? You’ve slipped through the net! I am one of those obsessive Vegemite lovers! It is great when you sick, pregnant, sad, happy, cold, studying for exams, needing a midnight snack! On toast or Saos (crackers) is best and sometimes the addition of cheese (toasted, slices, cream cheese, whatever) is heavenly. When I have lived overseas it is the thing I have missed the most!!!! A happy Vegemite here. A few of our Canuck friends have been through the Vegemite initiation. Some actually agree with you Kathleen, but a lot weren’t that impressed!!! Vegemite! Boy it makes a mess on their little faces and clothes, but the good thing is, as dark and horrible as it looks – it never stains and they loved it! Jay swears it is Mick and Pete! !